Resilience is the ability to bounce back, grow, and thrive through stress, challenge, and adversity. Resilience can be learned, practiced, and improved. Here are some skills that can help lawyers perform under pressure. Chronic stress is a fact of life for many lawyers. Over time, chronic stress can undercut your ability to perform optimally and to lead effectively. Dr. Larry Richard's research indicates that many lawyers rank quite low when it comes to resilience, often falling within the 10th percentile or lower.1 Fortunately, decades of research shows that resilience can be taught, practiced, and improved. Resilience skills help you cope with stress, remain task focused, increase your ability to overcome setbacks, and perform under pressure. This article explains what resilience is and what abilities help to increase resilience. It also provides three research-based skills you can begin using today that will build your resilience. Analyze what pushes your buttons. Help others savor good news. Flexible and Accurate Thinking. Resilient people are solution-oriented and capable of seeing a problem from all sides. Self-regulation. An important aspect of being resilient is knowing how and when to regulate your behavior and emotions. It might be tempting to send that tell-it-like-it-is email to opposing counsel, but while doing so might make you feel good in the short term, rarely will it advance your long-term goals. Self-awareness. People with high self-awareness are able to identify their own counterproductive thinking patterns and have a good understanding of why they are thinking and acting a certain way. Meaning and Purpose. Resilient people derive a great deal of meaning from something in their lives, whether it is work, family, volunteering, or another personal activity. Connection with Others. A common misconception is that resilient people can handle things all on their own. This could not be further from the truth. Resilience is about building strong relationships, being able to communicate effectively, and being willing to reach out for help. Research shows that even having one other person to count on increases resilience and happiness levels. Optimism. When you hear the word "optimism," do you think of a big smiley face, or Pollyanna, or even an ostrich with its head stuck in the sand? That's not the kind of optimism that builds resilience. Optimism as a resilience ability is about a thinking style and not about a personality trait. Figure 1 compares optimistic and pessimistic thinking styles and illustrates how each style can affect you. Lawyers can implement easy strategies that build their resilience. Here are three research-based skills you can implement today that will build the resilience abilities discussed above. 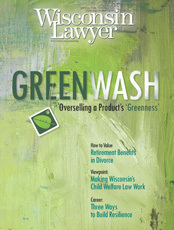 Lawyers who may need help can contact the State Bar's Wisconsin Lawyers Assistance Program (WisLAP). This program provides confidential assistance to help Wisconsin lawyers, judges, law students, and their families cope with problems related to the stress of practicing law by maintaining a professionally staffed telephone helpline and a support network of trained volunteers. Confidential support is available at (800) 543-2625. The WisLAP Coordinator is Linda Albert, who can be reached at (800) 444-9404, ext. 6172. Describe factually what pushed your buttons (who, what, where, when). Write down your reaction – both what you did and how you felt ("I felt angry and yelled"). Write down exactly what you were thinking in-the-moment during the challenge. Ask yourself whether your reaction helped or hurt your ability to find a solution. People tend to focus only on the reaction part of the equation, but those reactions are driven by how you think. If you want to change your reaction to a situation, you need to change the way you think about it. Targeted Resilience Abilities: Self-awareness and flexible and accurate thinking. 2) Help Others Savor Good News. When someone enters your office and says, "I have a problem," how do you react? Like most people, you probably stop what you are doing and listen. But how do you react when someone shares good news? Dr. Shelly Gable's research7 shows that how you respond to a person's good news is as important for the health of the relationship as how you respond to bad news. This applies across the board, from personal relationships to business interactions. (See Figure 2: "The Good News Is.") Only "active constructive" responses build strong relationships; the other three styles weaken relationships. Targeted Resilience Abilities: Connection with others, self-awareness, and self-regulation. Paula Davis-Laack, Marquette 2002, MAPP, is a stress and resilience expert who works with attorneys to help them perform at optimal levels and avoid burnout. In addition to designing and teaching resilience workshops for attorneys and law students, she teaches resilience skills to soldiers in the U.S. Army. She writes extensively about resilience, stress management, and work/life balance for Psychology Today, The Huffington Post, Ms. JD, and other publications. Contact her at com paula marieelizabethcompany marieelizabethcompany paula com, or visit www.marieelizabethcompany.com. 3) Shut Down Worst-Case-Scenario Thinking. This style of thinking happens when the negative part of your brain takes over and spins a worst-case scenario in your head. It is a downward-spiral style of thinking that leaves you unable to take purposeful action. You are more prone to this style of thinking if you are tired or stressed or have ambiguous information. For example, you might get an email from a partner you just submitted an assignment to that says, "Come see me now" with no other information. As a parent, you might turn around in a store and notice your child is not standing next to you. Both situations may cause you to feel anxiety, even panic; but, not being able to take purposeful action to find a solution makes this style of thinking particularly worrisome. Write down all of the worst-case-scenario thoughts you are having. Make up an equally improbable best-case scenario. The purpose of this is to generate some positive emotion to jolt you out of worst-case-scenario mode. Write down the most likely scenario. Develop a plan to address the likely scenario.8 Targeted Resilience Abilities: Flexible and accurate thinking and optimism. Figure out what is within their control during a setback. Do not see where they have control over causes of their setbacks and often fail to find solutions. Know "this too shall pass." They know that a stressor might be around for a while, but it will not be around forever. Think that a stressor will be around for a very long time. Know how to compartmentalize. If they have a setback at work, the fallout does not bleed into other areas of their life. The Good News Is: "I just made partner." Congratulations! You have been putting in a lot of work for many years now. How are you going to celebrate? That's great, but aren't you going to have even more pressure at work? When are you ever going to see your kids? That reminds me! I've been meaning to tell you that I made partner as well. I was so nervous about whether it would happen, but I've been building my book of business for years, so I had my fingers crossed! Lawyers face daily challenges and stressors. You can build the specific resilience abilities mentioned above to maximize the likelihood that you will be able to optimally perform through not only big, but also daily, life stressors. 1 Larry Richard, Herding Cats: The Lawyer Personality Revealed, 7 LAWPRO Mag. 2-5 (2008). 2 Sheldon Cohen et al., Emotional Style & Susceptibility to the Common Cold, 65 Psychosomatic Med. 652-57 (2003). 3 Lyn Y. Abramson et al., Optimistic Cognitive Styles & Invulnerability to Depression, in The Science of Optimism and Hope 75-98 (Jane E. Gillham ed., 2000). 4 Hilary A. Tindle et al., Optimism, Cynical Hostility & Incident Coronary Heart Disease & Mortality in the Women's Health Initiative, 120 Circulation 56-62 (2009). 5 Gregory McClell Buchanan & Martin E.P. Seligman, Explanatory Style & Heart Disease in Explanatory Style 225-32 (Gregory McClell Buchanan & Martin E.P. Seligman eds., 1995); see also Martin E.P. Seligman, Flourish: A Visionary New Understanding of Happiness & Well-Being 190-94 (New York, NY: Free Press, 2011). 6 Martin E.P. Seligman, Learned Optimism: How to Change Your Mind and Your Life 63-66 (New York, NY: Random House, 2006). 7 Shelly L. Gable, Gian C. Gonzaga, & Amy Strachman, Will You Be There for Me When Things Go Right? Supportive Responses to Positive Event Disclosures, 91 J. Personality & Soc. Psychol., 904-17 (2006). 8 Karen Reivich & Andrew Shatte, The Resilience Factor: 7 Keys to Finding Your Inner Strength and Overcoming Life's Hurdles 172-80 (New York, NY: Broadway Books, 2002). 9 Seligman, supra note 6, at 43-50.